The biggest sea-dwelling crocodile ever found has turned up in the Tunisian desert. This prehistoric predator grew to over 30 feet long (nearly ten meters) and weighed three tons. Paleontologists have dubbed the new species Machimosaurus rex and describe it Monday in the journal Cretaceous Research. 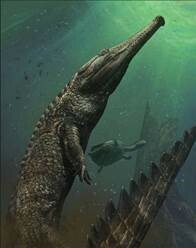 Although the recovered remains are fragmentary, enough remained in the 120-million-year-old rock to identify the reptile as the largest known member of a peculiar lineage of crocodiles that spent their lives almost entirely at sea.